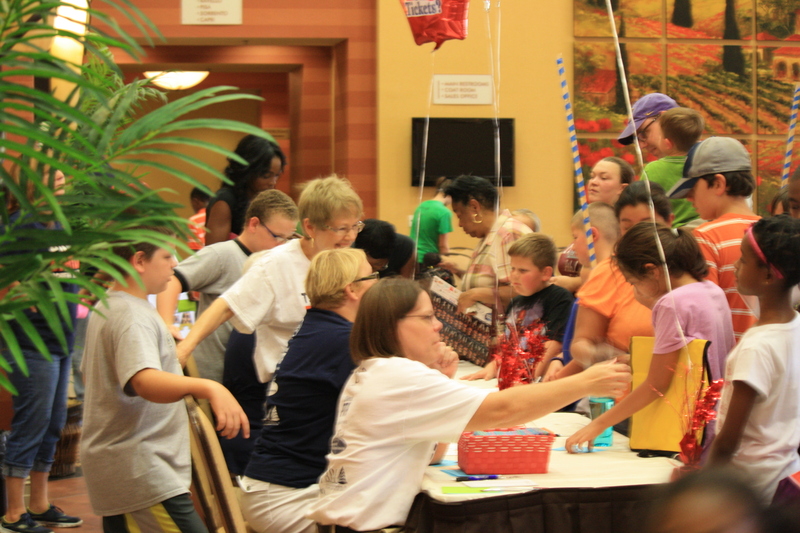 The 2nd Annual Illinois PTA Southern Region Back-to-School B.A.S.H. (Backpack and Supplies Handout) was filled with returning friends and new ones. The classroom of Growing Scholars Educational Center’s Eins-Team invited families to take part in engineering experiences. Dental Safari provided free dental check-ups, cleanings, and fluoride treatments to children. Our friends from St. Louis Children’s Hospital lead participants through Safety Street, teaching children and adults how to stay safe on the street. The magic of Ronald McDonald and Abra-Kid-Abra drew children to the stage, as did the fashion show sponsored by Wee-Peat Consignment Shop and music provided by the students of Exeter Music. We distributed backpacks and supplies to children entering kindergarten through grade 6 and provided families with information about services available in our community. Southern Region’s B.A.S.H. goal is to help families get their children ready to go back to school. The backpacks and supplies are a good start but there is so much more. This year’s addition of the Dental Safari Company checked one more thing off their list. Our vendors shared information on how to stretch the families clothing budget, after school activities, healthcare options, healthy snack ideas, and everyday savings opportunities. Programs parents can bring to their schools to enhance their children’s educational experience were also available and so much more. We are already working on next year’s event. Many of our exhibitors are planning to return and new companies have expressed interest. We are also hoping to add additional services that will check more things off our families ‘to do’ list, and lessening their burden. Thank you to our sponsors: The Edge; Garjo, Inc.; DBA McDonald’s; Growing Scholars Educational Center; Newbold BMW; Newbold Toyota; Tom’s Building And Repair, Inc.; The Bank Of Edwardsville; Body Connections; Empire Comfort Systems, Inc.; Illinois Children’s Mental Health Partnership; Catholic & Community Credit Union. Without their support, we would not be able to bring this event to our families. ← Answer the Call for Resolutions – and Make a Difference for Illinois’ Youth!